The new GARDENA AquaRoll M Easy Metal hose trolley has a very sturdy and robust design and can be used for even the most demanding garden applications. Several ingenious details make the hose trolley particularly easy to use. 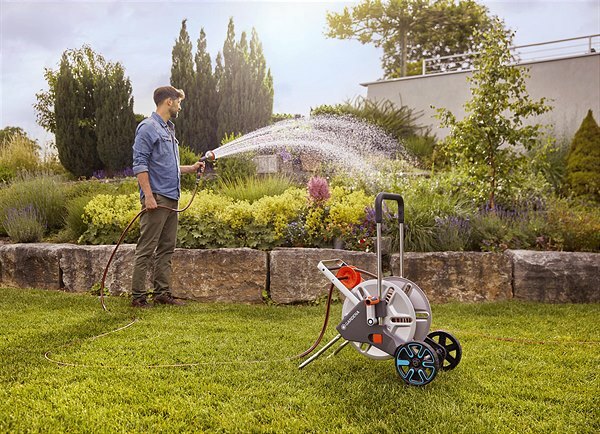 In their updated range for the 2018 garden season, GARDENA presented their new plastic hose trolleys, which have already received the coveted Red Dot Design Award. Now, three new metal hose trolleys complete the range. The new GARDENA metal hose trolleys are extremely sturdy and can be used for even the most demanding garden applications. In addition to sturdiness, ease of use also plays an essential role. Therefore, the impressive new models also come with many ingenious details for maximum convenience. The robust GARDENA metal hose trolleys are fitted with a strong metal reel. The high-quality aluminium handle has a plastic coating for ultimate comfort. The handle is also height-adjustable and can be lowered to save storage space. To ensure that the hose does not kink and always permits maximum water flow, the models have an angled hose connection on the inside of the reel. An anti-drip device prevents water leakage following use or during transport of the hose trolley. As on the M and L-sized plastic models, the new GARDENA metal hose trolleys also have the Kick&Stand function. The fold-out supporting foot and high wheels guarantee maximum stability when unwinding the hose. The supporting foot can be easily folded away to save storage space. The new GARDENA AquaRoll M Metal hose trolley is easy to manoeuvre thanks to its large smooth-running profile wheels. The collapsible plastic crank with soft plastic components means winding the hose back up is easy. The AquaRoll M Easy Metal and AquaRoll L Easy Metal models are also equipped with a hose guide. This ensures that the hose winds up evenly, with the need for manually guiding it. All hose trolleys in the GARDENA range are frost-proof. The exceptional "Made in Germany" quality is backed by a five-year warranty on all models.